UPVC Patio doors are a great way to bring natural light into your home, making your room brighter and thereby allow you to enjoy your living space more. There are a number of different options for patio doors, some of which may suit your home better than others. This is a great choice of material when it comes to external doors and so to help you choose which one is best for you, here is our guide to UPVC Patio Doors Prices and Designs. For any external door, surely the key features needed will be strength, security, long life span. Alongside these will be choice of design, energy efficiency, ease of use and low maintenance. 1 Strength, Security & Lifespan. Any door needs to be rigid and not expand or contract excessively. A door that flexes or changes size will not fit correctly and allow draughts or water penetration. Not only that, but it will be difficult to use if it keeps jamming. The door is also likely to be less secure as it does not fit properly. UPVC itself is a very stable material and does not expand or contract like wood or metal. This means that it stays the same size and always fits into the frame as it was originally fitted. In addition to the inherent stability of UPVC, the frames and door contraction features chambered sections which not only help to improve rigidity, it also allows for galvanised steel reinforcing to be inserted to further enhance overall strength. The stability of UPVC also extends to the endurance properties. Modern UPVC doors don’t deteriorate in terms of appearance and, it does not rot and is impervious to most chemicals in the atmosphere. In respect of the glazing elements, toughened safety glass should be fitted as standard, not only to keep your family safer, but also to comply with building regulations. 2 Design, Energy Efficiency and Low Maintenance. The choice of design when it comes to UPVC patio doors is quite extensive. Not only in appearance but in function. You can find French, Bifold or Sliding versions in an endless range of permutations of colour, size and appearance. Energy efficiency is high on the agenda with a lot of homeowners and is addressed in a number of ways. UPVC itself is a good insulating material. Double or triple glazed panels provide a good barrier to heat & cold. 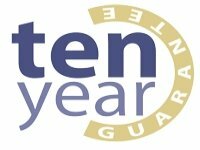 Water & wind proof seals are fitted to eliminate leakage and draughts. The double glazed unit insulating properties can be further enhanced with the use of inert gasses such as Argon, Krypton or Xenon within the gap between the glass panes. Mentioned beforehand, and unlike wood or metal, UPVC does not deteriorate by rotting or rusting. The colours are stable and UPVC does not require painting. With UPVC patio doors, the most you are likely to need to do in terms of maintenance is to keep them clean and lubricate the moving parts when necessary. If you still think that the only colour choice you have with UPVC is white, then you should be pleasantly surprised to know that there are around 20 or so different colours that you can choose from. The most popular coloured UPVC doors use “foiled” colours. This is where a coloured skin. Or foil is applied to the UPVC, then heat & pressure bonded to the surface during the manufacturing process. This creates a finish that is fade proof and crack resistant. UPVC Patio Door Prices and Design Options. Here we take a look at each style to highlight the advantages of each. Characterized, and easily recongisable by the way they look and function, French doors are a set of double doors that can be fitted to open inwards or outwards. The 2 doors are hung in the frame side by side and open from the centre. It is possible to have a centre mullion (post), but it is likely to get in the way when you go in or out of the room. Although you can have them full height glazed, a typical classic French patio door will have lots of smaller panes of glass in a 3 panes wide x 5 panes high configuration. However, you can vary this according to what best suits the proportions of your doors. In terms of how big an opening you can fit them into, the practical width limit for each individual door would be about 900mm or so, with the narrowest at around 450mm. This would allow for the smallest opening where you could fit French doors to be around 1000mm including the frame, and the largest at about 2000mm including the frame. If the opening where you want to install the doors is over 2000mm it is quite popular to fit side panels to make up the space. For external French doors, it makes them more secure if they are fitted to open outwards. An intruder will find it far more difficult to force them out than with an inward opening door. 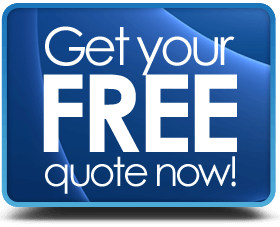 How much do UPVC French patio doors cost? Bifold patio doors are a series of panels hinged in such a way as to allow them to fold to the left or right. When closed, they look similar to a regular set of sliding doors, but when fully opened they stack flat against the side walls leaving a totally unobstructed opening to easily go in or out. The door panels run on rollers so they are very easy to move. The load bearing rollers can either be at the top or the bottom of the door frame. 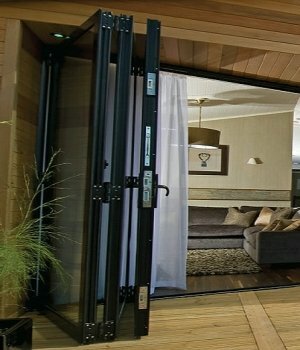 If you have top hung bifold doors, you need to make sure the overhead fixings are very strong & secure to take the weight of the door. Bifolds’ are very good for large, medium or small openings, even a 2 panel bifold door can be fitted. For smaller openings. Bifold & French patio doors are more practical than sliding patio doors for small openings, but bifold and sliding are the best for larger openings. As with the other designs, UPVC bifold patio doors come in a range of colours, including a textured wood grain effect. Doors are kept secure by anti-lifting tracks and multi-point locks. How much do UPVC Bifold patio doors cost? This type of patio door works as the name suggests, by sliding side to side in order to open or close. 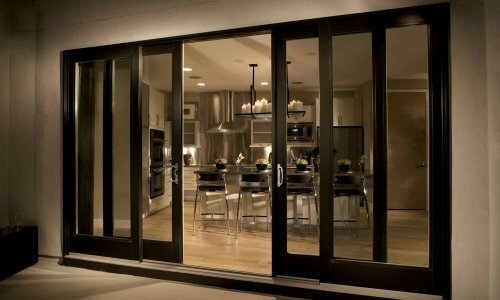 Sometimes they are called bypass patio doors, due to the way that they bypass each other when sliding within the frame. This design is one of the more popular, alongside French patio doors. There are some options for tilt & slide patio doors, where one of the panels can not only slide side to side but also be tilted inwards from the top to allow for a lot of ventilation without having to open the door. The angle of how much the door “leans” backward into the room is mechanically limited for safety. You cannot slide the door whilst tilted. As a point to note, if you have internal blinds fitted, then the tilting door can interfere with them if they are not fitted far enough away to allow for the tilt. Sliding patio doors are fitted with anti-lift tracks and multi-point locks to enhance security. As with both Bifold & French Designs, UPVC sliding patio doors can be found in a wide range of colours & finishes. It was mentioned briefly before, but when it comes to smaller openings, you will be a little compromised on how much clear exit / entry you have. Unlike Bifold or French designs which move the doors out of the way when opened, sliding panels must remain within the frame at all times. This means that for a 2 panel set, you only ever have a maximum clear opening of 50% because both the doors are slid to one side. How much do sliding UPVC patio doors cost? 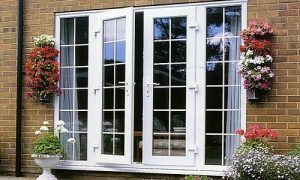 Which is the best UPVC patio door design? Well, that is going to depend upon your personal taste, budget and property type. If you are looking for cheap UPVC patio doors, then it’s likely that sliding UPVC patio doors can be found at the lowest prices. If you are looking for classic styling and character, the French UPVC patio doors may suit you best. If you want panoramic views and have a large space to fill, then bifold UPVC patio doors would be a great solution. However, taking all the above into account, what you will definitely get, is a very long lasting strong & secure door, needing a minimum of maintenance that will keep you warm (or cool) and look good for decades.